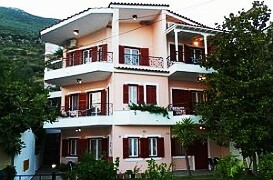 We offer you a host of lovely apartments to rent during your Holiday to Vassiliki. These are located in Vassiliki Village itself or along the bay in Ponti. There is a coastal road that runs between Vassilki and Ponti or you can amble along the beach between the two. 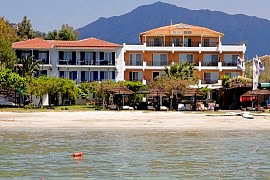 Ponti is about a 15 - 20 minute walk from Vassilki Village. In Ponti there are also lovely 3* and 4* hotels, windsurfing clubs, 3 lovely tavernas serving delicious home cooked meals and a mini market which sells your basic grocery essentials. A larger supermarket 'Euro Market' can be found further along the road on the left, towards Vassilki village. Near Euro Market is also a Petrol Station and our scooter hire collection / drop off point. Wind Club Apartments are located adjacent to Grand Nefelli Hotel and guests at the apartments can use the facilities of the hotel. All the apartments are really nice and you can choose between studios, two bedroomed or 3 bedroomed apartments. 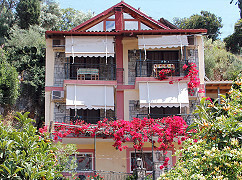 Vassiliki Blue Apartments are located on the hill just behind the village centre overlooking Vassiliki Bay. Within a few minutes walk are all the lovely cafes, bars and tavernas of Vassiliki. The apartments can accommodate upto 5 people and are fitted with tv, air conditioning, free WiFi, bathroom and a fully equipped kitchen.